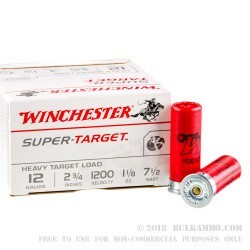 Winchester Ammunition is famous for their commitment to innovation in design, not the least of which is attributed to its shotshell developments. The Super-Target line is known for its hinged wad, patented by the Olin Corporation in 1993. While this was not the first hinged wad developed, it is a great improvement as it will collapse more than 80%, while its predecessors would collapse to only about 50%. The result, according to engineers is that it overcomes the normal variations of volume of propellant or shot from conventional loading equipment, resulting in more consistent closures and crimps of the shotshell. More consistency in construction correlates with more consistent performance. Also, the space created by the collapse of the wad slows the buildup of pressure upon firing, which will help to increase velocities of the shot, and actually lower felt recoil. 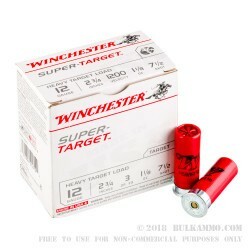 This case features 250 rounds of 12 gauge Winchester Super-Target loaded in 2-3/4" hulls. The shot size is #7.5 and the amount of shot is 1-1/8 oz. Winchester manufactures these in East Alton, IL and uses clean-burning powder and primers in this shotshell cartridge. Funny how this is target shot, but target ranges will not let you use it there. Well, one in the area will. So, they will be my new practice area. 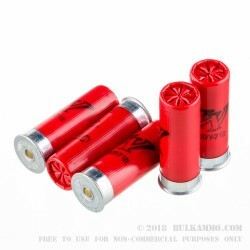 Q: What is the FPS on these rounds? A: Hi Robin, Thank you very much for your question! The stated velocity for these rounds in 1200 FPS. Normally velocities are measured in a 20"-24" barrel for optimal powder burn time, so you may see lower real world velocities if you use a shorter barrel.